Earlier this year I was introduced to Kimpton hotels via a status match into their Inner Circle program. I have since become a huge fan of the brand and the little touches that they add to make your stay exceptional. You can check out my review of the Donovan House Hotel in DC for examples of how they went above and beyond. During my Stay in washington, Kimpton offered a free bike pass for Capital Bikeshare, D.C.'s short term bike rental system. They also gave us helmets to use which were very much appriciated as navigating a city for the first time on 2 wheels can be treacherous. Biking is such a great way to get around, and Kimpton made it even better by including everything you need for a day of pedaling. I was very excited to learn that Kimpton is going to make their bike program even better. 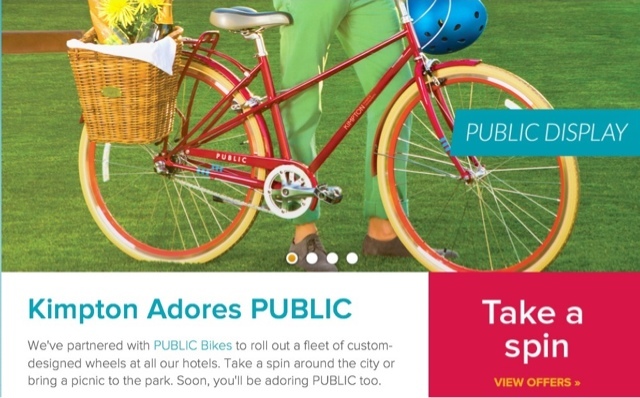 They will now have a fleet of cool retro-looking bikes available at every one of their hotels for guests to use. More information can be found on Kimpton's site.